Sway Tower, a Grade II listed folly in the heart of Hampshire's New Forest, is possibly the first tall mass concrete structure in Britain. It was built by eccentric Yorkshireman and judge Andrew Peterson, on his retirement from the Indian Legal Service. Allegedly, he was inspired by Sir Christopher Wren, who appeared to a local medium in seances. The tower is 66m tall and 5.5m square, and took a team of 40 workmen around five years to construct. It rests on a foundation 2.7m deep, and the concrete is 600mm thick at the base of the tower and 300mm thick at the top. Concrete was poured in 500mm lifts, using an internal working platform to avoid the need for cranes or scaffolding. The tower’s 13 floors are supported on cast iron beams. It contains 11 large rooms. There is a spiral staircase — with almost 400 steps — housed externally in a 2.7m wide octagonal stairwell. In December 1879, prompted by the Tay Bridge disaster, Peterson asked consulting engineer Rollo Massey to check the stability of the new tower, which proved satisfactory. Peterson had intended a light for the top of the tower but it didn't go ahead as it was thought vessels in the Solent would mistake it for a lighthouse. Before the main tower was constructed, Peterson had built a smaller structure some 150m north of Sway Tower, perhaps to test the method. 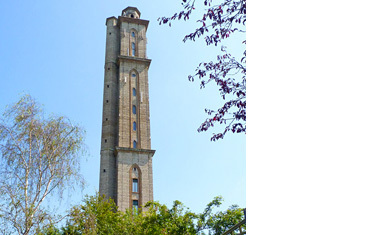 This sibling tower has six floors and an internal spiral staircase. It is now in a poor state of repair and its entrance has been sealed. Peterson died in 1906 and Sway Tower became his mausoleum until the 1950s. There was expensive restoration following the 1987 hurricane. These days the tower is used as a communications mast, and the low-level buildings adjoining it contain Bed & Breakfast accommodation.